The typical betting shop consists of an open room that can accommodate between 25-50 people. At almost any time of day, young men, with whom sports betting is most popular, can be found congregating in these shops, watching TV highlights and analysis and reviewing and discussing the day’s matches in order to choose their bets. On weekends or evenings when the volume of matches is highest, patrons spill out from the shops onto the streets, discussing the evening’s matches and the bets they plan to play and hope to win. Sports betting is a source of enjoyment for many of its participants and, for most, there is an air of excitement and hope as they place their bets. Payout sizes are similar to American scratch tickets and if you play frequently, you’re more likely to win eventually as well. Almost all regular bettors can recall a time when they won. They can tell you what they bought with those winnings and what they plan to spend their next winning on as well. Even those who themselves have never won a large sum, are able to recall a friend or acquaintance who has won a substantial amount. Most people are lured to the betting shops by a love of soccer, but the most salient feature of sports betting for its participants is the possibility of this financial payout. In my study we began with a listing of young men, 18-40 years old, working informally around commercial centers in Kampala. In this group, we found that more than one out of three people participate in sports betting in most weeks. Even more striking, on average, these participants spend between eight and twelve percent of their weekly earnings on betting. However, bettors only win back 50-65 cents per dollar spent. For a population that sits close to the poverty line, these losses over time could have serious implications for their personal and family finances. This is understood and acknowledged by many of the participants. The majority recognize that they have lost more money than they have spent, and yet they continue to play. Furthermore, 75% of bettors report a “way to get money” as their primary reason for betting. Demand for betting undoubtedly has many sources, enjoyment and camaraderie among participants, as well as misunderstanding and misperception of the rate of return from participation are likely important factors. My larger study attempts to examine a number of these factors. My initial analysis took bettors’ stated financial motivation for betting seriously. In particular, people in the sample appeared to have significant unmet liquidity needs. This is the result of demand for a number of readily identified large expenditures, coupled with lack of access to affordable credit and difficulty saving. In light of these constraints, the appeal of betting is amplified as an alternative way to make otherwise difficult purchases. Of course, this strategy comes at the high cost of substantial losses from participation over time. To demonstrate the importance of this factor, I first show that winnings do affect both the likelihood and size of large expenditures that people make. This effect is particularly strong among people with limited ability to save. Second, I show that improving peoples’ ability to save with a simple savings box, like a piggy bank, reduces how much people demand betting. In addition, having bettors think about a large expenditure they would like to make leads to a considerable increase in a measure of betting demand. And finally, participants who learn from a budgeting exercise that their ability to save is better than they previously thought, reduced demand for betting. All of these findings are consistent with demand for betting resulting, in part, from unmet liquidity needs and impeded ability to save effectively for desired expenditures. Finally, an analysis of the available options for credit and saving suggest that the returns on these two alternative strategies of generating liquidity may not be significantly better than the return from betting for many people in the population. This final finding suggests that constraints on saving and credit may be pushing people towards a negative-return activity and improving peoples’ ability to save or access to affordable credit may reduce betting demand. In the next phase of this study, I will look at other factors leading to high betting participation including breakdowns in personal budgeting, misperceptions of the actual return on betting, and small-sample fallacies. In further research I hope to measure the impact of betting on bettors themselves, as well as their family members, themes highlighted from focus group discussions with spouses of bettors. Further work will also explore the social dimensions of betting participation, evident in observations of betting locations. 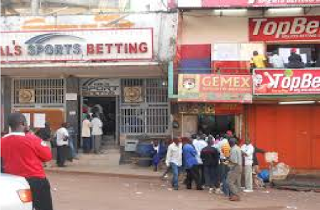 Given the growth and magnitude of the sports betting industry across many African countries, further study of this topic is important for understanding the financial realities of the people in this population, how sports betting is impacting their lives, and if and how other services can be targeted at vulnerable populations to ensure that any negative effects are mitigated. Additional findings from the research can be found here. Most updated version of the report and appendices can be found here.